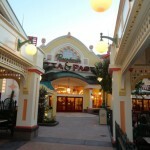 Halloween Time at Disney California Adventure is much more “quiet” than it is over at Disneyland. 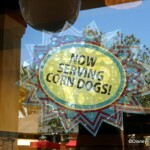 There are, however, a handful of special menu items that are available through October 31st. 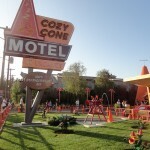 On a recent visit I discovered a fun combo at Schmoozies in Hollywood Land. 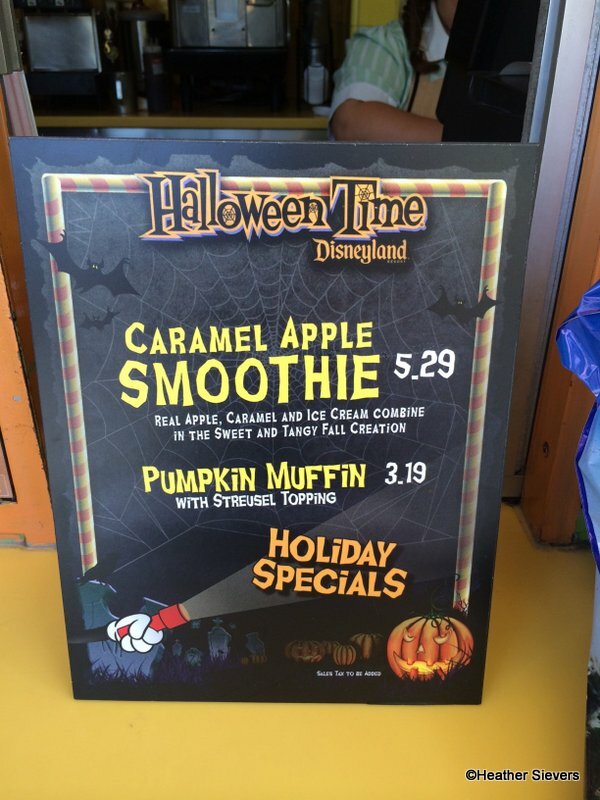 The Caramel Apple Smoothie and Pumpkin Muffin are currently being featured as Holiday Specials. Of course I had to check both of these items out. The Caramel Apple Smoothie is made from fresh Granny Smith Apples, Caramel & Ice Cream. I think it can be called a smoothie because it has real fruit in it, but don’t get me wrong, it’s NOT a healthy item. It’s really more like a shake. Totally delicious, but not something you’d get from a juice bar! Schmoozies makes all “smoothies” fresh to order, so it does take a few minutes to get your drink, especially if the line is backed up. 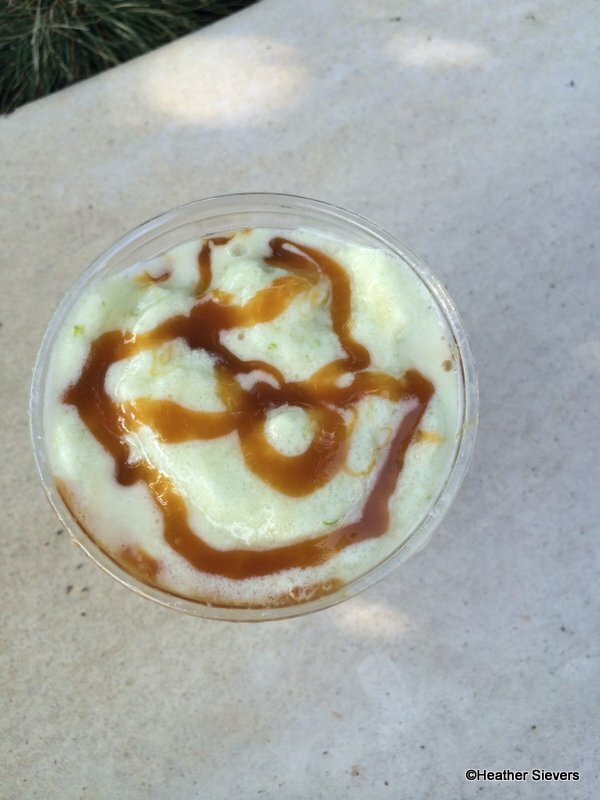 I really enjoyed the Caramel Apple Smoothie and was surprised to be sucking up chunks of crisp apple pieces through my straw. The smoothie is VERY sweet. Almost reminds me of sour apple gummy rings, which I love, but I can only eat a handful. It was the same with this smoothie, I shared it with a friend & we couldn’t finish the whole thing. The Caramel Drizzle on top is Ghirardelli Caramel Sauce. Do you see the hidden Mickey??? 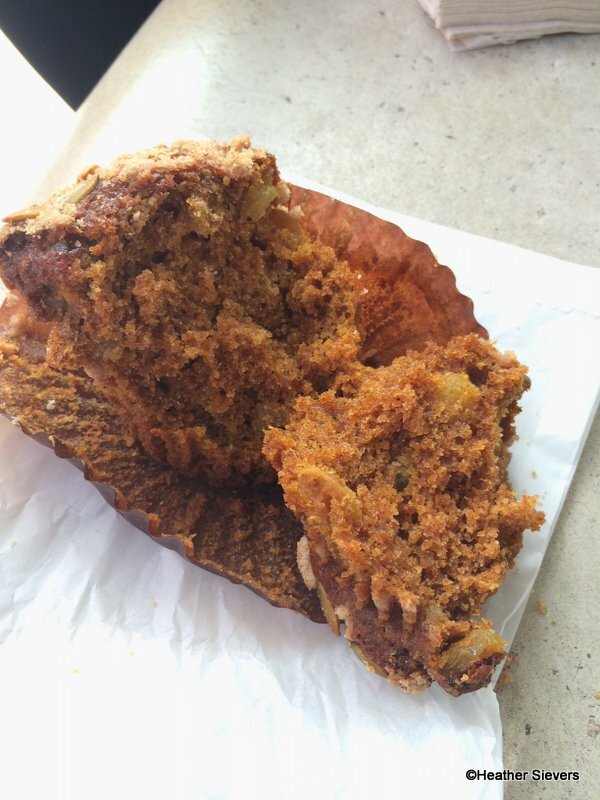 The Pumpkin Muffin here at Schmoozies was much different than the one served over at Disneyland. 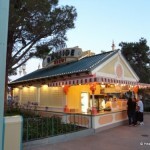 The one at Disneyland is much more cupcake-like, with cream cheese frosting and all. I will loosely say that this one is a little bit healther version of a pumpkin muffin. More muffin-like than cupcake-like. Topped with Streusel and Pumpkin Seeds, the muffin is moist and filled with Golden Raisins. Of course I prefer something with cream cheese frosting, but this muffin was also enjoyable! 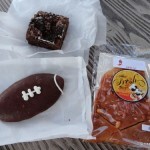 Overall, I think this is a great little “Fall” snack combo. The smoothies at Schmoozies are tasty, enormous, and perfect for sharing! 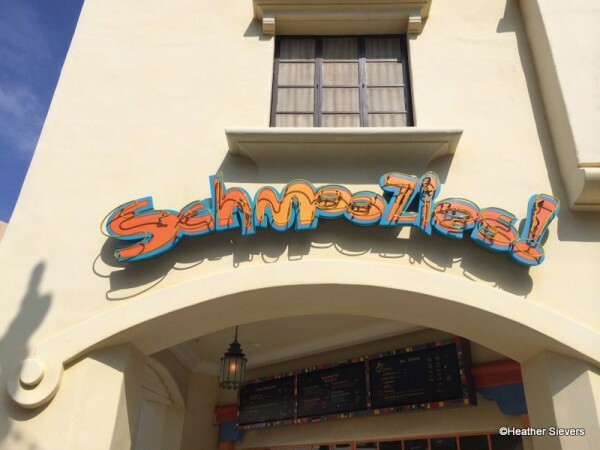 Have you ever tried a smoothie from Schmoozies? Do you have a favorite flavor? 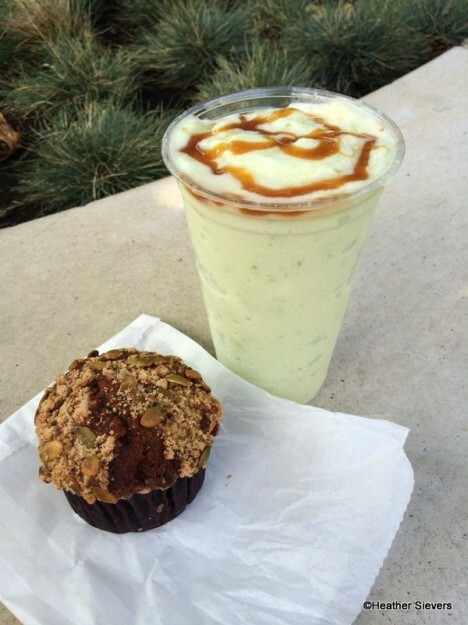 And one last question that I think I know the majority answer to already… Cream Cheese Frosting Pumpkin Muffin or Streusel & Seed Topped Pumpkin Muffin? Let us know in the comments below. If I ever get to the DLR, I will have the longest list of ‘Must Try’ foods ever seen. I’d have to spend all my time and money just sampling all of the things that I’ve seen here on the DFB! BTW, Heather, with cream cheese frosting, please. @Essie – I’m with you! Cream Cheese all the way!